Often these days we hear people bemoaning how isolated we live, not even knowing who our neighbors are. So a very neighborly pumpkin pie tea time was a welcome surprise. And a very tasty one! Some people have stated that they’ve lived next door to people for 15 years or more without even knowing their names. And in our former neighborhood one neighbor wanted our Homeowners Association (HOA) to pay for a party so she could meet her neighbors instead of her just going over and saying “Hi.” Astounding! Of course, I realize that people also get surprised when the police show up at a neighbor’s house to arrest them for having a meth lab, so maybe her reluctance was understandable (but still not worth the HOA throwing a party on her behalf). We’ve always been the types to take the effort to meet the folks next door. Here in our new neighborhood it’s been a very positive experience so far. That experience got even more positive the other day when one of our new neighbors with whom we had already become acquainted rang our front door bell and was toting a homemade pumpkin pie. Her timing couldn’t have been more perfect. We had just steeped a big pot of Scottish Breakfast tea, which is one of our preferred tea with such a treat. It’s a blend of Assam and Keemun that steeps up strong enough to take some milk and a bit of sweetener. Some people recommend Ceylon Black or Green, Dragonwell, or a nice Darjeeling, but we find these too tame to go with the flavors in a good pumpkin pie, which this was. Nutmeg and cinnamon were evident but not so much so that the pumpkin flavor came through, too. 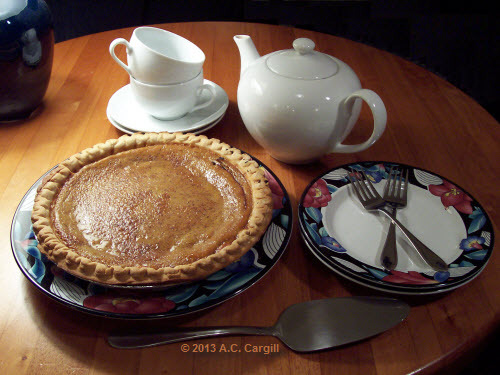 To make a long story short, the pie and tea didn’t last long and neighborly relations were improved immensely. Gee, I wonder if this would work on an international scale? 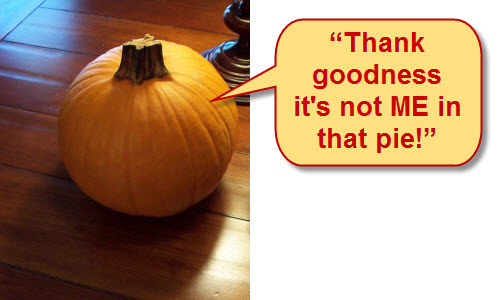 One final note here: the pie pumpkin that hubby and I bought awhile back (and were going to make into a pie but didn’t have the heart to) feels pretty relieved, as you can see below.